Welcome to Sunil Janah's Home Page. Mr. Janah has been physically unable to review all the material at this website, but supports it in spirit. This site is still evolving. We hope that you will find something of use here. Your comments and questions are welcome. With your help, we hope to make this a useful resource. You may wish to read the Contents (normally on the left margin - but below in the no-frames version) and the Introduction (below) while the images load. Some browsers may not let you do this - you may have to wait the first time you access this page. The photographer, Sunil Janah, has the copyrights for the images on this website. Please respect the need for copyright, and obey copyright laws. The pages at this website are best viewed with your browser not just maximized, but set to full-screen view. In Windows Internet Explorer 5, the F11 key toggles between full-screen and normal modes. For other browsers, see the link above. To read image captions (in Internet Explorer), slide mouse pointer onto image areas. 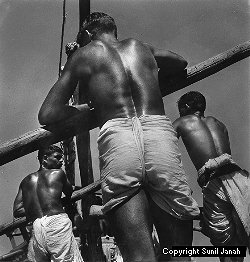 Starting in the forties, when India was in the throes of famine and mass struggles against British colonial rule, an Indian photographer, Sunil Janah, began producing some striking pictures, that touched many Indians' lives. Through the drama of the peasant and labor movements, the horrors of partition, and the years of rapid industrialization and urbanization that followed India's independence, Sunil Janah continued to photograph India and her people, traveling all over the subcontinent. These photographs, the work of a gifted craftsman, can be enjoyed, by all, for their strong visual impact, and appreciated, by photographers and others, for their composition and technical quality. They were taken, mostly, in natural lighting, often under difficult physical conditions. While many of his photographs reflect aspects of India that seem timeless, Janah also captured India in transition. He recorded many tumultuous and critical events that changed history, as well as ways of life that have, unfortunately, become history. 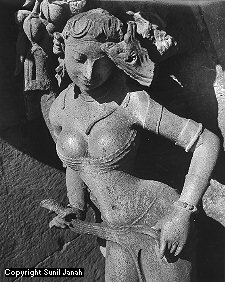 For all these reasons, these images should be of interest not only to those interested in photography, but also to students and scholars of Indian history, politics, arts, anthropology and archaeology. His pictures of famines, of the independence movement, of partition, of remote tribal peoples, of dance, and of temple sculpture, constitute a powerful educational resource. These, however, are but the backdrop for Sunil Janah's main focus, which, has remained, steadfastly, on the ordinary people of India - on her factory workers, miners, artisans, and peasants - on her city dwellers, villagers and tribal folk. His skills as a photographer bring the warmth and personalities of these individual human beings to life, as it were. It is worth noting that he was one of the first photojournalists to turn his camera from the rich and famous of India towards the common people, and to portray them, with affection and respect, as individuals. In the course of his work, Janah did, of course, repeatedly encounter the movers and shakers of his place and era. 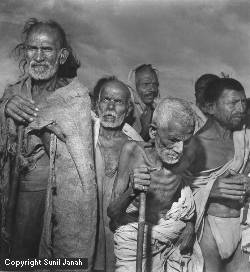 Thus, his photographs of the salt of India's earth are complemented by portraits of luminaries. These range from men and women of politics like Jawaharlal Nehru, Sardar Patel, Mohammed Ali Jinnah, Subhas Bose, P.C. Joshi, and Indira Gandhi, to a galaxy of personalities from the literary and artistic fields, to the physicist Satyen Bose (of Bose-Einstein statistics), the sage Jiddu Krishnamurti, and India's "great soul", Mohandas Karamchand Gandhi. For those who have experienced the sights of India, these photographs will have emotional appeal. Given their geographical and temporal range, they will reveal aspects of India that may be unfamiliar even to many Indians. For those who have never been to India, these photographs will open a window to another, parallel, human universe, seen through a practiced native eye. We thank all of you who came and saw Sunil Janah's photographs at the recent exhibitions in New York City (1998) and San Francisco (2000). Please see the exhibitions links for more on these. 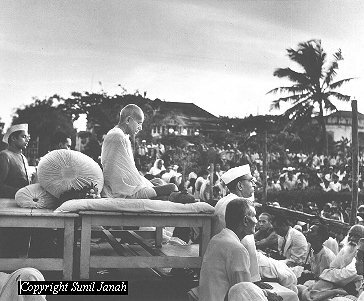 This has eight of Sunil Janah's photographs. You may have to close India Abroad's black log-in box and and then use the + magnifier. -- See also notes above & below virtual exhibition links in photographs page. gives a (pre-1998) listing of Sunil Janah's exhibitions. - Sunil Janah's review, in The Times Higher Education Supplement (Aug 20, 1999) of Ramachandra Guha's biography of Verrier Elwin: Savaging the Civilized: Verrier Elwin, His Tribals and India. - section-texts for the San Francisco exhibition (2000), providing the historical context for each section, along with photographs of panels, with the individual pictures captioned and cataloged. - section-texts for the large exhibition in New York (1998), giving the historical context for each section, with a bit more detail than in the SF (2000) exhibition; but panel shots are not yet ready. The Books, Documentaries, Exhibitions item at the NY '98 exhibition site gives a (1998) listing of books with Sunil Janah's photographs. Website images: (c) Sunil Janah, 1939-2004. Site includes attributed text by: Sunil & Monua Janah, Ram Rahman, many others. Copyrights for these texts remain with the authors. Site design, coding, image editing, unattributed text: Arjun Janah, 1998-2004.